A friend from college days, is an angel for animals. People too; animals just tend to be extra lucky to meet Erin. Erin found this dog, who she’s calling Tasha about a month ago, running around the Pigtown part of Baltimore. Tasha is back to good health and looking for a family to join. Erin already has two dogs that call her house home. Tasha needs her own place. If I were not allergic, I would be tempted. Tasha is looking for a home! Found about a month ago as a stray in Pigtown (Baltimore, MD), was not claimed by anyone, so I’m trying to adopt her out. She is likely a German shepherd mix of some kind (I think there’s some yellow lab in there, maybe also corgi? Who knows! ), about 2 years old, 50 or so lbs., spayed and UTD on shots, heartworm negative, and microchipped. She gets along OK with cats who will stand up to her (although needs to be introduced slowly), but seems picky about her canine friends, so probably should be an only dog (at least until someone has a chance to work with getting her better socialized to other dogs). She is VERY people friendly, loves to cuddle and give kisses, loves to ride in the car. Is generally pretty mellow in the house, not a super high-energy dog. She is OK with being kept in a crate, although does whine for a few minutes when left alone, so would do well with a frozen Kong or some other kind of yummy treat to occupy her. Housebreaking is not 100% yet, but close, and the crate helps immensely with that. She walks nicely on a leash — will pull a bit, but does better with an anti-pull harness. If anyone is even interested in fostering her until she can find a permanent home, that would be a big help! If you’re interested, you can message me via Facebook or email at eharty@gmail.com. Although a home in the Baltimore or Washington, DC area would be great, my friend has set up successful pet hand off relays before. 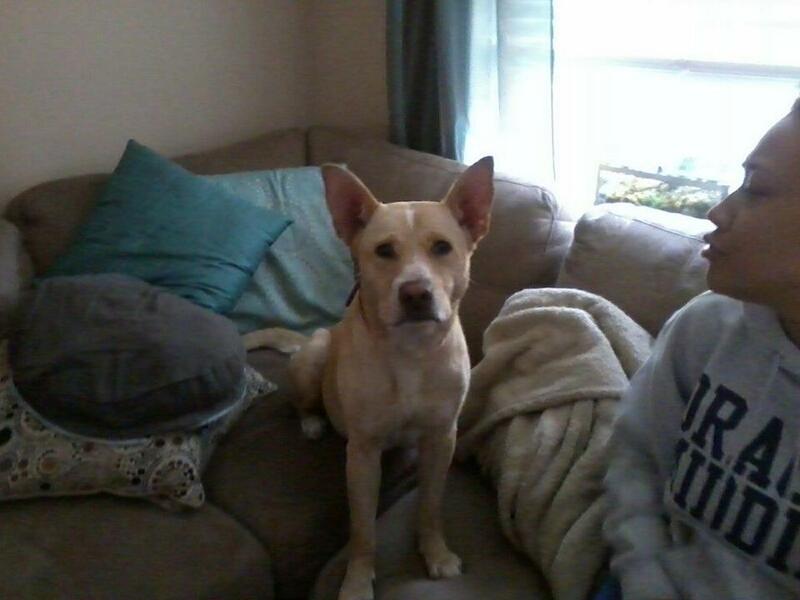 This entry was posted in Good intentions and tagged adopt, Baltimore, dog, rescue on May 28, 2012 by onechicklette.